Three little blue penguins have been stolen from their nest in New Zealand, say conservation officials. According to local rpeort, two men were seen using a crowbar to prise rocks off the penguins’ burrow in Hawkes Bay and then hook the birds out by their neck. One of the penguins died in the process and was left behind, but two were taken away. 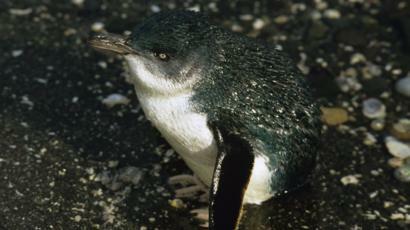 Little blue penguins are the smallest breed of penguin and are a protected species in New Zealand. Authorities believe the thefts might be an indication of a smuggling operation. The Department of Conservation (DOC) Hawkes Bay Compliance Officer Rod Hansen said it was disturbing and he believed it might not be a one off. The theft was carried out at night on on 24 January. The DOC said they received reports of two men seen digging into the burrow while a woman held a torch. It is not clear where the birds were taken to and the suspects have not yet been identified. The DOC said the theft was “particularly disturbing”. “It is a very vulnerable time for these wee penguins. They moult from January through to March and stay in their burrows for protection… [this] further suggests the poachers knew exactly when best to target the birds,” said Hansen. Little blue penguins, which typically measure just over 25cm tall and weigh around 1kg, are the world’s smallest penguin. The population of little blue penguins is declining in New Zealand and anyone found committing offences may be jailed up to two years and fined up to NZ$100,000 (£52,000; $68,500).